An entertaining and informational lecture with photographs of real room makeovers. o Jam packed with before and after pictures where downsizing of stash was not required! Lecture is based on my book "Creating Your Perfect Quilting Space", but is not limited to it. Many more photos from current makeovers have been added. Popular Fabric Folding Technique demonstrated along with inexpensive Work In Progress Storage. Lecture is funny and moves along at a fast pace! Lecture #2: Grab n' Go! 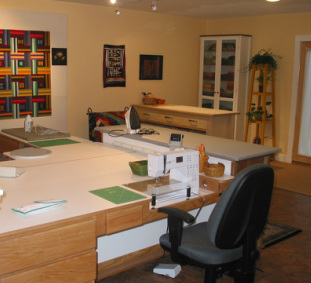 A successful quilting retreat or class starts long before you leave the house. 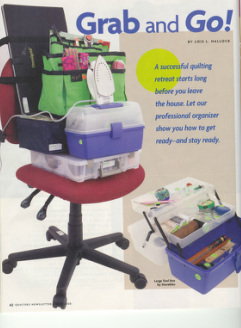 Let a professional organizer who is also a quilter show you how to get ready and stay ready. Low cost portable ergonomic and organizational solutions will work both at home and away. Lecture is packed with information and is sure to delight quilters of all abilities!